whose long career in television included starring roles in three popular series, died on Sunday at his home in Century City. He was 59. The cause was prostate cancer, said Pamela Golum, a spokeswoman for the NBC-TV show “Blossom.” Mr. Bixby, the show’s director, was on the job until last week. In the CBS comedy “My Favorite Martian,” which ran from 1963 to 1966, Mr. Bixby played a newspaper reporter who was the comic foil to a mischievous extraterrestrial played by Ray Walston. Three years later, after that show went off the air, he moved into the role of a wise, stalwart parent in “The Courtship of Eddie’s Father.” The ABC comedy, which ran until 1972, featured him as the widowed father of a precocious 6-year-old, played by Brandon Cruz. After the NBC series “The Magician” in the 1973-74 season, Mr. Bixby went on to star in “The Incredible Hulk,” which ran from 1978 to 1982 on CBS. In the series, inspired by a Marvel comic-book character, Mr. Bixby played David Banner, a research scientist whose body chemistry is altered by a freak laboratory accident. When angered, Banner is transformed into a huge, greenish creature who terrifies evildoers as well as innocents. The muscle-laden Hulk was played by Lou Ferrigno, a bodybuilder. Mr. Bixby returned to comedy in the 1983-84 CBS series “Goodnight, Beantown,” with Mariette Hartley. A native of San Francisco, Mr. Bixby attended San Francisco City College and studied speech and philosophy at the University of California at Berkeley. He was working as a lifeguard when an advertising executive offered him a job as a model in car ads. He soon went to Hollywood, where he landed a part in an episode of “The Many Loves of Dobie Gillis.” After that, he worked steadily in television and occasionally in films, including “Irma La Douce,” “The Apple Dumpling Gang” and “Lonely Are the Brave.” He appeared on Broadway in “Under the Yum Yum Tree” in 1964 and “The Paisley Convertible” in 1967. 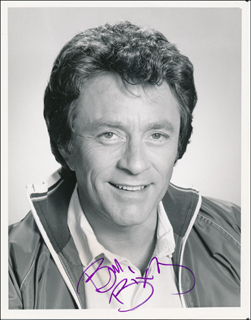 Before taking up directing duties for the comedy “Blossom,” he directed several episodes of the ABC mini-series “Rich Man, Poor Man” in the 1970’s. He was also the host of the public television series “Once Upon a Classic” in the late 1970’s. This year, he began an experimental hormone-treatment program at the University of California-Los Angeles, Medical Center. He had already been fighting cancer for a year. In March 1981, Mr. Bixby’s 6-year-old son, Christopher, died of a throat infection. Mr. Bixby’s former wife, the actress Brenda Benet, comitted suicide less than a year later.